On January 1st, 2006 Lexington United Soccer Club (LUSC) hired Brendan Donahue as its first full time Director of Coaching. Brendan arrived in Lexington with an extensive coaching background at both the collegiate, over a decade of coaching at the DI and III levels, and club level (former Boston Blast Technical Director). Brendan, a graduate of Middlebury College, currently serves on the Mass Youth Soccer Instructional Staff on a part time basis as well as being head coach of the GU16 Olympic Development Program Coach Donahue has been instrumental in developing LUSC into a full service soccer club that serves over 1,300 Lexington families and 280 volunteer coaches each year. Coach Donahue has had articles published nationally in the NSCAA Journal, US Youth Soccer’s Coaches Connection and his piece on “Maximizing Your Warm-up” was presented at the USYSA National Convention. 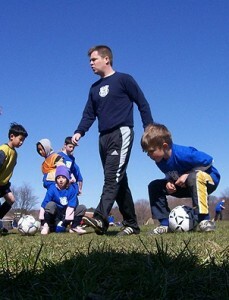 Coaching Philosophy: Coach Donahue is a firm believer in Guided Discovery and learning through the game. Instead of giving our players the answers to the problems the game presents, can we choose exercises that are age appropriate and challenging, but not overwhelmingly so, and become skilled at asking the proper questions that lead the players’ to find their own solutions. You don’t create problem solvers, and in turn better players, by providing answers; you do so through guidance and patience.